This years Lancaster Santa Claus Parade form is now ready for you to complete. Please fill out and submit and that is all you need to do. You will see a confirmation page once submitted. Parade Marches off at 1:00 pm Sharp. Theme of this years parade is "Christmas Memories"
By signing below I/we agree to hold harmless the Saint John Lancaster Business Association(hereinafter SJLBA), its committee, officers, directors, volunteers, agents, employees and the City of Saint John and its agents, employee's and volunteers for any injury or damage that i/we may incur as a participant in the parade. I/We agree to hold harmless SJLBA and the City of Saint John, from any claim or liability for any injury i/we may incur as a participant in the parade. Your Registration has been successfully submitted. You will receive an email from us 1 week prior to the parade that will provide you with all the details and placement. You will receive further information on November 15, 2018 as to your placement number and timings and all parade details. Thank you for your participation and we look forward to seeing you at the Parade. 2. All entries must have decorations in order to participate in the parade. No political statements of any kind. The Santa Claus Parade Committee and the Parade Marshall reserve the right to deny participation of any entry that is deemed unsafe or does not adhere to standards and conditions set forth herein. Commercial tones are to be minimized. Entries should appeal to children first and adults second. 3. Signage identifying entrant or float sponsor should be placed either in front or on both sides of the float. If you would like to have your float judged for prizes, signage must be easily identifiable by the judges. 4. The height of the float should be no more than 12 feet from the road surface. 5. All floats should have LIVE or TAPED Christmas music. 7. Absolutely NO LIVE SANTAS on any float, as this confuses the children. · Wheels on floats must be covered, whenever possible to prevent costumes from getting caught. · People are to walk beside the float at all times as a buffer zone between float and children in the audience. 9. All marching or walking entries MUST CONTINUE TO MOVE FORWARD WITH NO STOPPING to avoid gaps in the parade. 10. Upon arrival please present your registration confirmation to the attendant who will allow entry to the set up area. Only authorized entries will be allowed to enter set up area. 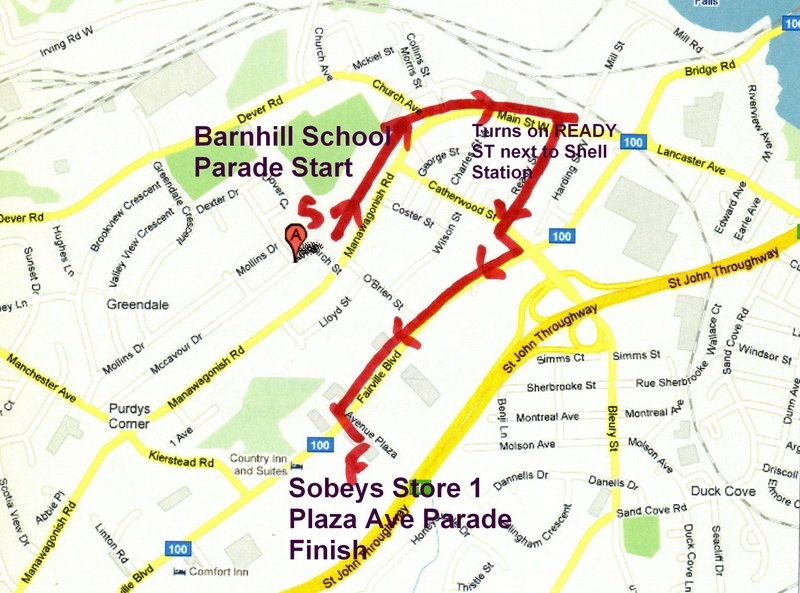 Arrival time is 11:00 am and parade will march off at 1:00 pm. Saturday November 24, 2018. 12. The spelling of “Christmas” must be used no abbreviations (ie: X-MAS, HAPPY HOLIDAYS, etc…) exception is “Happy Holidays” can be used if ”Merry Christmas” is also used. 3. There is NO FEE to enter the parade. Any donation of non-perishable food items will be given to the West Side Food Bank. 14b. the negligence or willful malfeasance of any member, officer, agent or employee of Saint John Lancaster Business Association or its committee. 15. Every entry must have a policy for liability insurance for any motor vehicle, trailer, cart, wagon or other conveyance that is required by the New Brunswick Motor Vehicle Act. 16. Trophies will be presented to the winning entries as decided by the Official Judges. Winners will be notified by the committee and trophies will be sent or arrangements made for pick-up by the winners.